Go to the town of Lorane, which is about 15 miles west of Cottage Grove and about 20 miles SW of Eugene. From Eugene. Most folks prefer to take Territorial Road to Lorane. Head south on Bailey Hill Road to Lorane Highway to Territorial Road to Lorane. From I-5 South. Either drive north up Territorial Road from Curtin or exit I-5 at Cottage Grove and take the Cottage Grove Lorane Road. Once in Lorane: bear west on Siuslaw River Road. 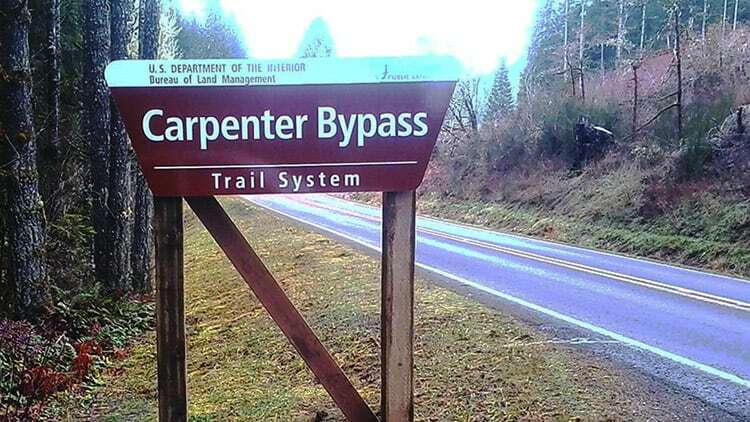 Approximately 1.4 miles west of Lorane on Siuslaw River Road (just after mile post 43), you will see a BLM sign proclaiming “Carpenter Bypass Trail System”. Turn left here onto Carpenter Bypass Road. After turning on Carpenter Bypass, continue 8/10ths of a mile to … the infamous Gravel Pile. This is a large gravel parking lot on the left side of the road that is sometimes partially covered by a pile of gravel used for road building. This is the bottom of the network and where some people park to start their ride. To start at the center of the network, head up the road another mile or so, past the Yellow Gate. The South Parking lot will be on your left. This is now the hub of DOD events such as All Comer’s Meet and Party at the Pass.